While out driving, there is always the chance that you will be involved in a car accident of some sort. People are not always careful when they drive; some are distracted by their phones and other individuals in the car, while others are just not mentally present at the moment—thinking about something else entirely while traveling upwards of 50 miles per hour. Others may even be too tired to drive, yet choose to get behind the wheel regardless. These acts of carelessness while driving cause hundreds of thousands of car accidents each year, necessitating the passing of certain laws to try and keep the streets safe. All drivers have slow reaction times, short attention spans, and are easily provoked. All of these are responsible for nearly every single accident that occurs on the road. What happens when we place other people in the driver’s seats and let them drive us around? Are we prepared for the consequences of not driving ourselves? With Uber, Lyft, Juno, and other rideshare apps becoming commonplace and a centralized means of traveling, accidents may occur more often. This is because there is a certain level of distraction that comes with being a driver for these companies. Drivers often use their phones while driving; they accept customers both while stationary and while already engaged in a route. They follow directions from the GPS on their phones and have to regard the app for any notifications. Further, some Uber drivers take long shifts and drive at odd hours, causing them to be tired or burnt out. Pair this with the need to pay attention to the passenger in the car and it becomes obvious that an Uber driver’s attention is split between the road, the app, and another individual. It goes without saying that this is extremely dangerous. Despite all of these possible problems, it is still expected that an Uber driver transport his customer to the necessary destination in a speedy manner, resulting in total satisfaction. There is no time to relax or rest, and in truth, these facts only contribute to the accidents that Uber drivers have. To make matters worse, Uber drivers routinely rely on their jobs as a necessary source of income, and if they are to get into an accident and face injury, drivers fear that if they press charges against Uber to collect compensation for their damages, Uber may take action and terminate them. You should never be afraid to pursue legal action if you believe you are in the right in an accident, especially if the accident in which you were involved left you with painful injuries that make living your life harder. Your company owes it to you to provide you with the necessary help or compensation so that you don’t economically suffer for something that was not your fault. Many people are given the runaround in these situations, and they end up suing Uber to get compensation. More information is below about how to sue Uber in case of an accident. If you are an Uber driver, it is absolutely crucial to understand the legal process behind filing a lawsuit against the company, as well as what your rights are. You should also familiarize yourself with the habits of Uber and what they tend to cover. The more information you have and the better prepared you are, the less surprises there will be in the event of an accident that you seek compensation for. 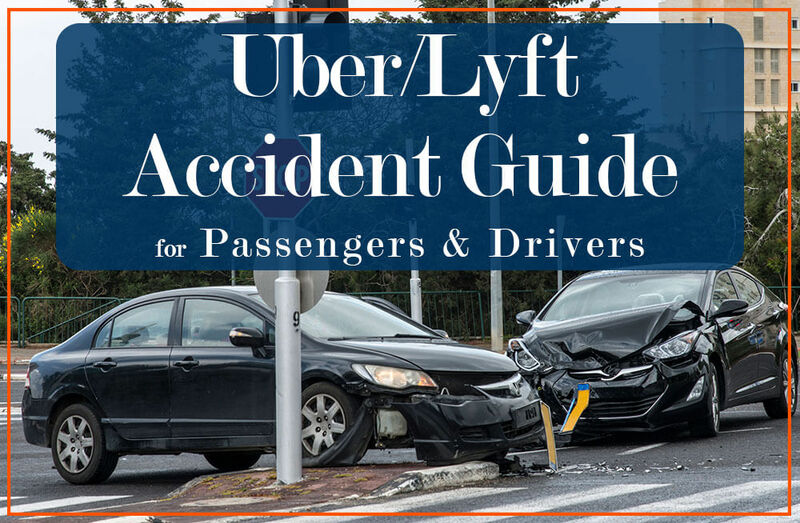 The goal of this article is to give you an in-depth look at many of the common scenarios that take place after Uber accidents and to give you necessary details about insurance and restitution. When Uber was founded, the company operated on a basis of using independent contractors to bring in profits. The business billed itself as a flexible work-from-home service that allowed drivers to set their own hours and drive whenever they felt comfortable. Its employment of GPS-based services that found the nearest driver to you meant that rides could come faster than before, and the prices were much lower than those listed by taxi cab companies. In all, the package deal proved to be a great sell for customers, and hundreds of thousands of people began using the app daily – which caused Uber to need even more drivers, which then led to a shortage as they struggled to initially find more drivers. And with the possibility of millions of dollars just waiting to be collected, Uber needed to find a way to net that money, and fast. Cue Uber abusing the laws of independent contractors in order to maximize profits. When companies contract independent contractors, they are not hiring employees. They are either provided by a staffing agency or work of their own choice and volition; this means that Uber, or any company that hires these individuals, can release them at will. It also means that the company is not liable for any damages, problems, mistakes, or other issues that arise from an independent contractor. If the independent contractor is the cause of the accident, the company will not claim any liability and leave the independent contractor to pay out of pocket to deal with the resulting damages (e.g., bodily injury and property damage). This is because there is no agreement in place that would force the company to have liability. So, for example, an Uber driver was involved in an accident and had to go to the emergency room to treat the injuries. The driver’s insurance policy would have said that because he was working, they did not offer coverage. Uber, playing the independent contractor card, would have denied responsibility because the driver was not an employee but an independent contractor. We live in a capitalist society, and thus there’s no surprise as to why this was the case. Uber is a company before it is a service. Its goal is to turn profits at the end of every day, and ensure that there are no losses. Any money the company can save is considered worthwhile—even at the expense of their drivers who make them money. Unfortunately, this mindset leads to problems with customers and drivers, and there was no clear solution for some time. When Uber drivers used to get into accidents, Uber was able to claim that they were not responsible for the actions o the driver, despite conducting a background check and providing a paycheck for helping with their services. After some events, a law was passed that mandated that Uber drivers must be treated like employees so that there would be no injustice when it comes to accidents. This was especially important in the realm of insurance: commercial driving means that your personal auto insurance policy is temporarily suspended. The company for which you are working is supposed to provide you with insurance, and since Uber did not, there were numerous cases of accidents without resolve. When accidents happen, there is usually a degree that separates how involved Uber will be and how likely it is that they will cooperate. Fortunately, many car accidents only result in property damage and not physical injuries. Those instances that do lead to broken or damaged belongings can be solved by the involved parties with no need to involve Uber. Property damage is not a debatable form of compensation; more often than not, the most necessary thing that you will need to repair is the vehicle. A mechanic will often provide you with an estimate of the work that needs to be done, and although attorneys may try to dispute it, the numbers will be hard to argue against. The police, Uber, and other entities generally do not get involved when an accident only results in property damage. E.g., bent fender, broken windshield, concave door, etc. When there are injuries, however, you should prepare yourself for a long and difficult journey. Expecting Uber to assist you throughout the entire process is wishful thinking akin to believing in Santa Claus. Remember what we said above about Uber’s focus on profits? To them, your injury signals a drop in profits, and they would rather cut their losses and hire another driver than help you through your injury and compensate you for your damages. From the moment you file an Uber accident claim to recovery, Uber will fight you to keep every last dollar in its bank account. After being forced to provide insurance, though, Uber is likelier now to provide you with coverage in the event of an injury than they were before. 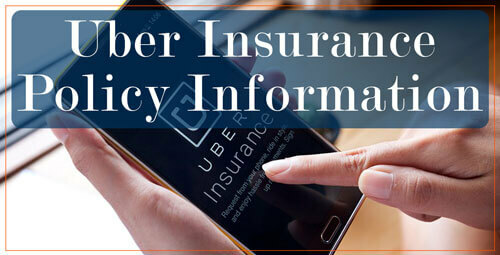 James River Insurance, Uber’s insurance company, covers Uber drivers in two different types of policies that are determined by the period the Uber driver is in. It would be unreasonable to consider Uber responsible for your injuries if you weren’t actively working at the time. It’d be like claiming you suffered an injury at work while you were off the clock and at home. The keyword here is “actively.” This means that you must be actually driving for Uber (i.e., you signed in and are driving passengers), not just idling with the app on and considering if you want to work today or go back home. There are different states in an Uber trip. The first, an idle period, means that you have the app on; you are not actually driving to a customer in this state. There is no accident coverage, but there is liability coverage in the form of a $50,000 policy. The second period is enacted when a customer requests a ride and you are en route to the location. At this point, the insurance will kick in, and you will have a $1,000,000 policy protecting you in the event of a crash. The third period commences when the customer enters the vehicle and lasts until he’s dropped off. So, legally, what are the problems? For one, Uber can claim that accidents happened at different periods, and thus, the different policies that vary in coverage would not be enacted. They may even claim that you had already logged out for the night or that you were responsible for the accident. The different tactics that insurance agents use to try and dismiss claims or prevent people from collecting settlements can be confusing and painful to deal with. Their agents are trained to confuse the insured as much as possible and even falsely admit fault. If Uber tries to give you the runaround, you will need to hire an attorney to sue Uber for your injuries. For this reason, it’s imperative that you communicate with an attorney after an accident. 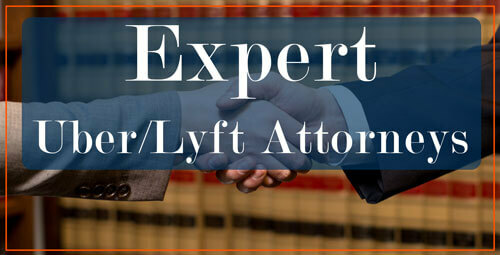 Expert attorneys with previous experience in Uber and Lyft cases are your best bet at getting the right coverage. And since you’re a responsible driver, you will already be familiar with all of the details regarding insurance and coverage, and you’ll thus know what to expect. In all likelihood, you won’t be able to continue driving for Uber once you’ve gotten into an accident. Either they’ll terminate your contract because you got into an accident, or because you are now filing a lawsuit to recover compensation. You need to follow a few steps that will help you stay on the right track. An Uber accident is no different in nature than a normal car crash, but some of the specifics may change. Firstly, your health and safety! You should make sure that you are not injured in the aftermath of the accident. Many times, small injuries won’t become apparent until much later due to the rush of adrenaline coursing through your body. You may not even be aware that you are cut or suffering from a sprain. Once you have evaluated yourself and made sure you have no broken bones or debilitating wounds, you should examine anyone else in the car. You need to be able to move yourself around or you won’t be able to help any passengers or other victims. If the situation is not serious and your passengers are unharmed, you can take the next step. However, if there are any injuries to anyone, call the police and paramedics. Trained professionals will come and assist you, even helping you move your car off the road and redirecting traffic so there is no additional danger. 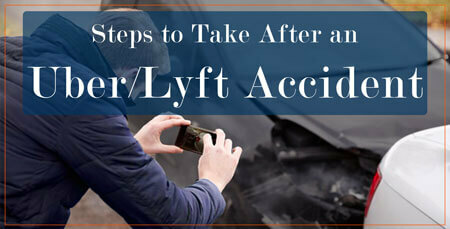 Next, gather evidence and document the accident as best you can. In the heat of the moment, you may forget to do this, but it is crucial that you have as much evidence as possible. The more evidence you have, the easier it will be to prove your case. The pictures you should take are as follows: the damage to each car, license plate numbers, the section of the road on which the accident took place, property damage, pictures of your injuries (if any), and picture of the driver’s licenses of those involved in the incident. Videos of witness statements or testimonies can also prove valuable. You should also take down the opposing driver’s information – get his name, insurance information, contact information, and more. Any information from the police, like a police report, can also be used to give leverage to your claim. After that, go to a doctor. Yes, you may say that you were not seriously hurt and the paramedics may have cleared you to go home, but even as your levels of adrenaline decrease, there may be other damages not visible to the naked eye. Internal bleeding and organ damage, as well as brain injuries and concussions, can go unnoticed for some days before their effects become visible or felt. You should schedule a checkup up with a doctor and take necessary screening tests to make sure you are, in fact, healthy. Medical bills form the basis for your personal injury claim, and with these expenses, you can look to receive a settlement to compensate you for the payments you had to make. Even for something as normal as stitches, you can be compensated for the bills. Lastly, you should seek the assistance of an attorney at Kenmore Law Group. If you wait to contact an Uber accident attorney, crucial evidence that you could have may be lost, or you may unknowingly mess up your claim. There are many choices people make that have resulted in them getting nothing whatsoever from Uber, and these choices could have been improved or avoided if they sought help from a law firm. Why should you hire an Uber accident lawyer? Simply put, we understand the law and it’s our job to help you. We are well trained in these areas of personal injury claims and we’ve been dealing with Uber and its insurance agents for years. Even though the purpose of the law is to make everything equal and fair, there are countless loops and hoops through which the opposing counsel can jump. It is our job to ensure that those hoops are closed so that Uber pays out what you deserve. You likely don’t have the time to take off work and negotiate with insurance agents or have sit downs with the company. You may not have the negotiation strategies and tactics to make sure you get a fair, adequate settlement if they tell you the most they can offer is a tiny sum. People often get drained and exhausted when pursuing legal action by themselves, and it is no surprise why. If you don’t know what you’re doing, you could even end up ruining your case by doing something wrong. For example, you might say something wrong to the insurance agent, thereby ruining your case. With the help of an attorney, you can be sure that your best interests are at heart and you can focus on healing. For example, there are numerous deadlines regarding taking legal action. If you eventually contracted a nerve problem or back pain in the wake of an accident while driving Uber, you may think it’s too late to file a claim. Our attorneys know the statutes of limitations and any exceptions that apply to them, for example (it’s 2 years from the injury or 2 years from the discovery of the injury, by the way). Up to this point, we’ve covered everything related to those who work as Uber drivers, but we haven’t mentioned what happens if you’re a passenger in the car. As stated elsewhere, it can be risky to be a passenger because you are placing your trust in another person whose driving skills and tendencies you are unfamiliar with. You expect Uber to have provided you with a driver who had a background check performed and whose driving record is clean. Sometimes, though, the Uber driver is not at fault, and someone else strikes the car. You are considered an innocent victim in cases like this. It is often not difficult to show that you were not at fault, and thus, that you deserve compensation. The hard part, as with all claims, is in proving that your injuries are as severe as you claim and that the medical treatments were all necessary to your recovery. 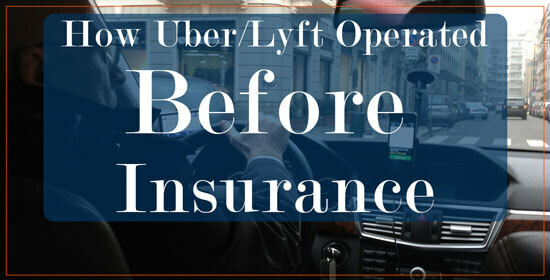 Fortunately, Uber’s insurance will cover injuries to passengers – it even has uninsured coverage, which protects you in the event that the other driver involved in the accident does not have insurance and thus cannot cover your damages. Additionally, if you are a person who was struck by an individual who was driving for Uber at the time of the accident, you may be able to work towards receiving compensation. As stated before, personal auto insurance companies have a policy that they do not cover you when you’re driving for money. Uber has tried to deny liability for the actions of its drivers, reverting back to the independent contractor status of these drivers. In many cases, this defense has worked, and receiving compensation has proven to be a challenge. In fact, the most likely scenario in which you would be able to receive a settlement is if the Uber driver has a passenger in the car – Uber then cannot say that the driver was not working, and its million dollar policy would be enacted. A lawyer can help you in situations like this. 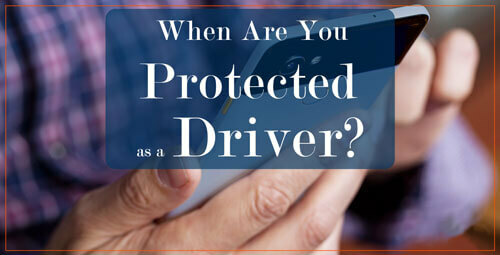 It is unfair that a passenger in an Uber vehicle can be covered for his or her damages due to being an innocent victim, but you as a fellow driver would not be afforded the same benefits. This all comes back to the fact that Uber will do everything it can to retain profits – it would rather pay one person than two, and it would prefer, above all else, to pay none of you. In the wake of an Uber accident, you may be wondering what you can receive if you pursue legal action. Like we said before, if you were not injured, you will only be able to get paid for damage to your property. These numbers are hard to argue, and you very likely will not require the help of an attorney; you can take care of that claim by yourself. When you’ve been injured, however, there are other types of compensation that can come your way. Have you been physically harmed to the point that you required hospitalization? If so, your medical expenses can be covered, which would include coverage for your stay at the hospital, the cost of medication and treatment received, and any physical therapy you need to undergo in the future. Further, some injuries may not heal all the way and require additional treatments or procedures at various points in the future. These future procedures can also be covered in the compensation delivered through an Uber accident lawsuit. Were your car and other belongings lost or damaged? If you were in a car crash, it is more likely that the answer is a resounding “Yes.” Your property can be reimbursed, replaced, or repaired at no cost to you if you successfully file an Uber accident lawsuit. Again, your best shot at gaining full compensation is with an expert attorney by your side. What about your job? Some people miss work due to injuries or because they need to recover. Some people even miss days in the future because of additional medical treatments. Uber can cover these costs in a claim; your wages should not suffer because of the fault of another person. How mentally harmed were you? A car accident and the ensuing injuries can take a heavy emotional toll on you, and as a result, you may be affected for years afterward. You could develop PTSD and psychological trauma from problems and complications in the accident, and these pain and suffering damages can be covered. Fortunately, in this day and age, Uber is so popular that our law firm has dealt with dozens of cases related to the company. We are no strangers to the tactics the company uses and we know the ins and outs of their negotiation process. For this reason, we believe our team of legal experts and attorneys at Kenmore Law Group are the best equipped to handle your Uber accident cases. We can sue Uber for the accident and obtain a just settlement for your injuries. 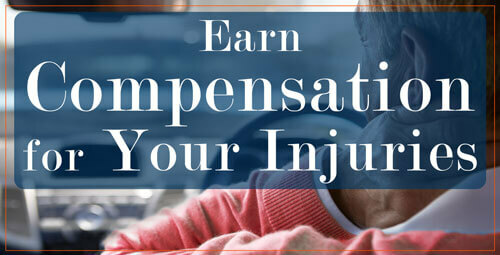 Whether your injuries were minor or major, you deserve to be compensated. Don’t let Uber’s insurance tell you otherwise. Call our law offices in Los Angeles to schedule a free legal consultation with an experienced attorney. You likely have questions about the legal process and what you can do to move forward – and we have answers. Don’t be afraid to discuss your injuries and what you expect out of a settlement, and we will give you our input and advice regarding your claim. 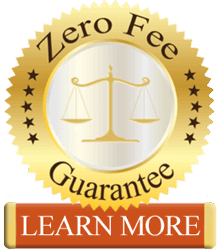 If you select us to represent you, we will give you a zero fee guarantee on your case, as we do with all clients. This promise ensures that you will not pay a single dime whatsoever to our law firm throughout the litigation process. We take care of all the costs of the case ourselves. If we win and bring you a settlement, our fees come from that sum, not from your savings. We believe you should never be forced to dip into your own pockets for legal assistance. And to boot, if we don’t win your case, you don’t owe us any money at all. 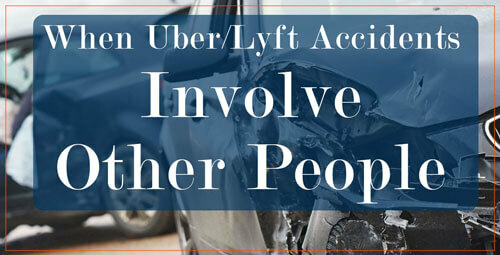 We know Uber accidents can be confusing, no matter if you’re a driver, passenger, or other party. You deserve help in receiving a settlement, and you deserve it now. Contact our offices at Kenmore Law Group to get started on filing a claim.